the whole “whole person” thing. – Naming a blog is harder than naming a kid. the whole “whole person” thing. I’ve got a small list in my brain, and on pinterest, a board, called “blog inspiration,” ideas that I want to write about here and queue up so I’m not posting five things on one day and nothing for a month at a time. Sometimes it’s easier to think and write, sometimes not. I’m distracted by chronic pain, by the best child ever, by dogs. DJ is getting old, and it’s likely this is her final year with us. I don’t read enough grownup books (but sometimes a couple of hours a day of Catwings and Puppy Love and Fox in Socks and Monkey With a Toolbelt) and I don’t write enough and though my movement is limited, I don’t get enough even within that. But I want my life to start being about more than RA and the child and the dogs again. I want some sort of spiritual practice, something like UU Lent, to get more physical activity (I have a “do your exercises” alarm on my phone and a small youtube playlist of gimp-friendly exercise, whether I do it depends on how much activity I’m doing that day already and sometimes, how strong inertia is at the time), to go out into nature more than i’ve been this winter, to snuggle with my husband more often, and to write, here and on livejournal, to release a bit of the shortform and “share this” response of facebook and twitter and to really think and write. I think I need to get some more automation going, e.g. get wordpress to at least link automatically if not repeat at livejournal (and dreamwidth? it already links at twitter and g+). But there are lots of things I do for an hour a day that aren’t writing or soul-feeding, so I know I can find time. 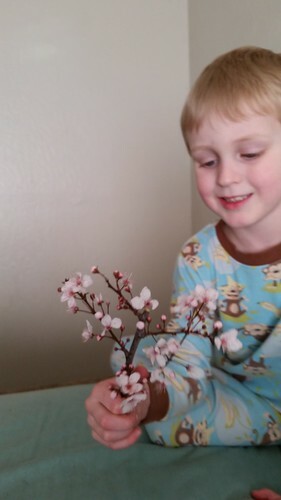 Having no clue about Valetine’s Day, Owen broke off a plum tree branch and brought it to me in bed as I awoke on Valentine’s Day morning, because he thought it was beautiful and wanted me to have it. Please help me find the big red book.